one Pâté de Campagne (8oz): a classically prepared pâté made of ground pork, onions, garlic and spices. one Mousse Truffée (8oz): Les Trois Petits Cochons’ best selling mousse. A delectable combination of chicken liver, truffles, sherry and Pineau des Charentes. one Saucisson Sec (8oz): a time honored recipe from the Pyrenees mountains of France, but handmade in the USA. one Saucisson à l'ail (7oz): a tender, hearty, fully cooked pork sausage made with lots of garlic and a hint of white wine. Mini Toasts (2.75oz): a great alternative to plain old boring crackers! Where to find a "Buche de Noel" in New York ? In France, on any Christmas table, you will be offered a Bûche de Noël as dessert. This cake which is prepared and garnoshed to look like a log is meant to evoke the Yule log that once burned in European hearths during the ancient fire-festival of the winter solstice. Made of layered or rolled genoise sponge cake filled with mousse or buttercream, the Bûche de Noël is often decorated with marzipan or meringue mushrooms, forest creatures, or holly leaves. Torres describes the log as "something festive, something you do only for the holiday." In France, the lines stretch long from the bakery doors on Christmas Eve, as families queue up to retrieve the bûche they ordered for the occasion. If you live in the New York area, and are looking to buy a bûche de Noël, Torres says he trusts Payard, Almondine, Financier, and Baked as respectable purveyors. Payard is offering for non-chocolate palate a Cassis Chesnut or a Cheesecake Berry Buche. Baguettes, macarons, Bordeaux, Camembert--French gastronomy holds a mythical appeal, with its long history and famed personalities. In this class, we discuss the reasons for its popularity and influence, starting with the publication of La Varenne's Le cuisinier françois in 1651 and concluding with French cuisine today. 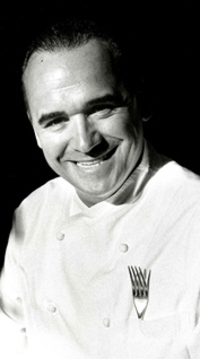 We look at key figures in French culinary history such as Marie-Antoine Carême, Jean-Anthelme Brillat-Savarin, Auguste Escoffier, Fernand Point, Gault and Millau, Paul Bocuse, and Alain Ducasse. We explore the cuisines of France and other Francophone countries, wines from both established and up-and-coming regions, France's longstanding pastry and baking traditions, and the impact of labels such as AOC (appellation d'origine contrôlée) on producers and consumers. Today..It is Crepe Day in France !!! Every February 2nd, since the middle age in France,we have been celebrating the Chandeleur, or Candlemas. La Chandeleur, or Fete De la Lumiere, is a very fun day for the kids. Not only do they eat a lot of crêpes, but they also can practice a fun game of fortune telling while making them. It is traditional to hold a coin in your write hand and a crêpe pan in the other, and flip the crêpe into the air. If you manage to catch the crêpe in the pan, your family will be prosperous for the rest of the year. Mix first all the dry ingredients, then add the oil and the eggs one by one, then the liquid little by little to obtain a smooth batter with no lumps. Let the batter rest for a while. Add Nutella, sugar or jam in the middle and roll them to serve. A dynamic group of new generation owners of Châteaux des Grands Crus Classés de Bordeaux will visit New York City for the First Annual Soirée des Grands Crus on Thursday, January 27th. For one night only, 82 Mercer in SoHo will be transformed into a modern version of a Bordeaux wine cellar to showcase wines from both the Left Bank (Pessac-Léognan, Margaux, Saint-Éstèphe, and Saint-Julien) and the Right Bank (Saint-Émilion and Pomerol) of the Garonne River. Guests will taste the châteaux’ most recently released vintages and will be able to place orders directly with the châteaux for purchase via Le Du’s Wines in the West Village. Châteaux owners scheduled to participate include Basile Tesseron of Château Lafon-Rochet (Saint-Éstèphe Grand Cru Classe); Stephen Carrier of Château de Fieuzal (Pessac Léognan); Jean-Jacques Bonnie of Château Malartic Lagravière (Grand Cru Classé de Graves); Emilie Gervoson of Château Larrivet Haut-Brion (Pessac Léognan); Jean-Michel LaPorte of Château La Conseillante (Pomerol); Ronan Laborde of Château Clinet (Pomerol); Mathieu Cuvelier of Château Clos Fourtet (Saint-Émilion Premier Grand Cru Classé); Laurence Brun of Château Dassault (Saint-Émilion Grand Cru Classé); and Jean-Antoine Nony of Château Grand Mayne (Saint-Émilion Grand Cru Classé. The evening will feature “The Breitling Grand Cru Challenge,” a blind tasting activity for attendees hosted by Jean-Luc Le Du of Le Du’s Wines and wine expert George Sape. The guest who can identify the selected vintages will win the grand prize of a Breitling Chronomat B01 watch (suggested retail value of $7690). Other prizes include some notable bottles of Bordeaux, including several magnums and double magnums. Thursday, January 27, 2011. 6:00 p.m. for early access ticket holders; 7:30 p.m. for general admission. Where: 82 Mercer Soho, 82 Mercer Street (between Broome & Spring Streets), New York City. Subway: 6 to Spring St., N,R to Prince St.
. Take a class on Champagne at Flûte Gramercy. Saturday, November 13. 6 to 7pm.
. Taste French Food, buy French books or French clothes at the Lycee Francais Fall festival. This annual fair, open to the public, is held at the French Lycee at 505 East 75th Street from 10 am to 4pm on Saturday 13th. A great occasion to start your Christmas shopping in a relaxed French ambiance and to spend some time with the French community. Activities for kids as well. Don't miss the Caneles de Celine, amazing French miniature pastries served with a Nespresso Cafe. The 13th annual New York Chocolate Show is the largest show in the United States completely dedicated to chocolate. This year’s Chocolate Show will also feature book signings by award-winning authors: cooking demonstrations in two culinary theatres featuring renowned chocolatiers and pastry chefs who will share secrets of the trade; a Kid’s Zone, dedicated to fun-filled activities for Young chocolate lovers and, a Chocolate Fashion Show (Wednesday November 10,2010). Cuis'in and Chef Eric Delalande will deliver two special Canapes boxes (4/5 people) for your Halloween evening. This month, I discovered a new place where to find a tasty baguette. Agata and Valentina is selling a "Country French baguette" which rich colored crust is crunchy and crumb airy like in France. My other favorite place is also at Silver Moon Bakery all away up to 105th street (check my post of March 24 in the Food category). Almondine at Dumbo is supposed to be very well rated too but I haven't tasted it. And I still haven't tried the one from the new Francois Payard Bakery on Houston Street. For ham, please avoid what they call French ham at Citarella, Grace Market and other places. It is made by Trois Petits Cochons and has nothing to do with the taste of ham in France. Even my boy, 8 years old, noticed it. I would recommend to ask in those places for "Prosciutto Cotto", yes from Italy, but the closest in term of texture and taste with the Madrange Ham in France. Born in Russia in 1867, raised in Paris since 1917, Kusmi Tea has become the most famous tea brand among celebrities (Lady Gaga claimed that Detox Tea helped her stop smoking). Known for their flavored green teas and bergamote-orange black teas, they started in New York by selling their teas at Dean and Deluca and just opened a store on 3rd Avenue and 61st Street. Blend of Maté, Chinese Green Tea, and lemon grass full flavored with lemon. Tasting advice: delicious plain or sweetened. The combination of Maté and green tea virtues -- diuretic and stimulating properties, richness in antioxidant -- makes Kusmi Detox the perfect companion for slimming and detoxifying diets. Known for its tonic properties, mate does not have the side effects generated by caffeine. Here's a recipe I tried yesterday that I'd like to share with you as we all liked it very much. Preheat your oven at 425 F.
In a very hot skillet, add oil, cherry tomatoes, garlic chopped (as much as you like), salt and pepper and sauté tomatoes until they are breaking down (between 3-5 minutes). Transfer to a large bowl and add fennel, more garlic if you like. Take a fork and crushed tomatoes in the bowl, leaving some large chunks intact. Mix with cubes of mozzarella (adjust mozzarella to the size of your pizza). The Pepperidge sheet will give you a pizza for 2 persons (2 slices each). Roll the dough with a little bit of flour to the shape you like. Fold over edge to make a nice border. Take a fork and make tiny holes in the crust. Spread the preparation on the crust and bake in the oven for 25 to 30 minutes on the top rack. GArnish with basil leaves. Delicious to serve with Arugula salad. Yummm...does that looks good ! Every Tuesday, after my class at Columbia, I stop to buy my bread for the week at Silver Moon Bakery on Broadway and 105 Street. For that, I am very French, I still need my piece of bread every morning ! Have you missed Payard Croissants ? 714 Madison Ave, 4th floor in the magnificent Mauboussin store. After opening the Mark a couple of weeks ago, Jean-Georges is on a new adventure: an organic farm-to-table restaurant on the first floor of ABC Carpet and Home building. I hadn't the time to try it yet but Jean-Georges gives you a glimpse of what you can taste in his blog. I'd love to get your own comment. Jean-George is personally my favorite chef in Manhattan. La Galette des Rois...oui, oui, oui, it is this week ! Look at this beautiful and yummy golden pastry cake...It is time for Epiphany this week and time for the Kings' cake and its almond cream filling.
. Another great address : Cuis'in. They will deliver until the end of January "pour les gourmands"
I tested both and there are both delicious...Bon Appetit ! 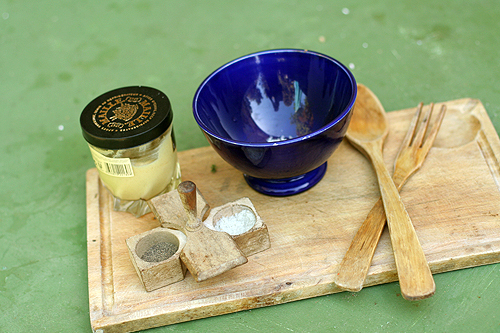 I was looking on how to explain clearly how to make French Vinaigrette and I found this great recipe by David Lebovitz. His latest book, The Sweet Life in Paris is a food-based memoir, filled with humorous and delicious stories about Paris with French-inspired recipes that are both sweet and savory. David has been living in Paris since 2002. One assumption that I'm going to make about the French is that they're not afraid to make things au pif, or "by the nose". I don't know if a precise recipe for sauce vinaigrette actually exists. But if there is, I bet few people follow it very closely. And Romain is no different from his compatriots when it comes to recipes, and rules. They are both for other people—and don't apply to him. Vinaigrette is just one of those things. It's a few simple ingredients which come together so well, when done right. 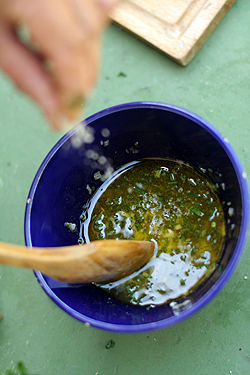 Anyone can make it: you just pour, stir, marinate, then taste until it's just right. But the salad dressings in France always taste better to me than elsewhere. So thought I'd follow Romain when he made a true vinaigrette. 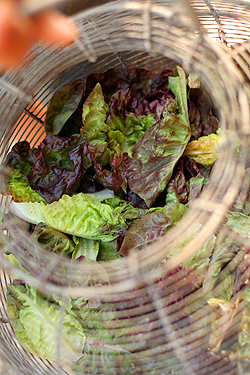 He was surprised at the idea of measuring anything, so I follow him through the steps, taking a few notes along with way (see Recipe, at the end) and along the way, I learned two French secrets for a great salad dressing. A Gourmand tour of Paris with the NY Times...Bon Appetit ! A marvelous painting of a gourmand at his table hangs in the Musée Carnavalet in Paris — a portly, pink-faced figure happily gorging on a regal casserole, with a bottle of wine at one elbow and a luscious-looking soufflé at the other. It is traditionally believed to be a portrait of Alexandre-Balthazar-Laurent Grimod de la Reynière, an aristocrat notorious in Napoleonic France for gratifying his palate with the same abandon as his contemporary the Marquis de Sade showed in indulging carnal desires. Whether or not the painting is actually Grimod’s likeness, it captures the eccentric, omnivorous spirit that made him not only a gustatory symbol in the Paris of his day, but the grand-père of all modern food writers as well. Starting in 1803, Grimod, whose family fortune had largely been lost during the Revolution, financed his voracious appetite by writing a series of best-selling guidebooks to the culinary wonders of Paris — its famous delicatessens, pâtissiers and chocolatiers — including the first reviews of an alluring new institution called le restaurant. His Almanachs des Gourmands were something new, the Michelins and Zagats of his era, and their offbeat style reflects the author’s larger-than-life character. Grimod was born in 1758 with deformed hands, one a birdlike talon and the other a webbed pincer. But he was not one to be held back, so he had learned to write — and dine — with metal prostheses. A social butterfly, he became a successful theater critic in Paris before the Revolution, survived the Terror and amused himself later by hosting literary salons in the cafes. And, of course, eating. It was on the trail of Grimod one day last summer that I passed through the vaulted arches of the Palais Royal, opposite the north wing of the Louvre, and into a vast, empty courtyard. In Grimod’s day, the Palais Royal was the heart and soul of Paris, a rowdy entertainment center filled with brothels and sideshows that, despite its louche ambience, also boasted some of his favorite specialty food stores and restaurants. For me, it was the first stop in what would become a week of wandering the modern city armed with a map on which I had marked streets mentioned by Grimod. One of the most exciting things about the Almanachs is that they include detailed gastronomic walking tours of Paris, called “nutritional itineraries” — each one a vivid window onto the past. Fortunately, on my last day in Paris, the past and present seamlessly met, and for a change the restaurant seemed to come to me. I was strolling the Rue St.-Honoré near the site of another long-gone boulangerie when I noticed a tiny row of medieval structures attached to the Church of St.-Roch. One hole-in-the-wall turned out to be a minuscule restaurant complete with original pot-cluttered kitchen. It was called La Cordonnerie (the Shoemaker’s) and, according to the blackboard, it served cuisine de marché, fresh market food. I had accidentally hit pay dirt: the fantasy of a charming French boîte. There were fewer than 20 seats in this intimate space, which dated from 1690, with blackened beams against the low white ceiling. The chef was a maestro in his cramped workplace, preparing alone the day’s menu of foie gras in homemade chocolate sauce and roast pork with field mushrooms. He was also the owner, I later learned, having inherited the restaurant from his parents. I felt sure that Grimod must have eaten here at some time or another. He certainly would have approved of the setting. Of one of his favorite restaurants, Le Gacque’s, he wrote: “His salons are nothing sumptuous, but the cuisine is good, the wines excellent, and the prices moderate.” Plus, there was a friendly, unobtrusive staff. Le Grand Véfour, 17, rue de Beaujolais, 75001; 33-1-42-96-56-27; www.grand-vefour.com. Au Rocher de Cancale, 78, rue Montorgueil, 75002; 33-1-42-33-50-29; www.aurocherdecancale.fr. Le Procope, 13, rue de l’Ancienne Comédie, 75006; 33-1-40-46-79-00; www.procope.com. Lapérouse, 51, Quai des Grands-Augustins, 75006; 33-1-56-79-24-31; www.laperouse.fr. La Cordonnerie, 20, rue St.-Roch, 75001; 33-1-42-60-17-42. Mustards: Maille, 8, Place de la Madeleine, 75008; 33-1-40-15-06-00; www.maille.us. Chocolates: Debauve & Gallais, 30, rue des Saints-Pères, 75007; 33-1-45-48-54-67; www.debauve-et-gallais.com. Pâtisserie: Stohrer, 51, rue Montorgueil, 75002; 33-1-42-33-38-20; www.stohrer.fr. Gastronomic literature: Librairie Rémi Flachard, 9, rue du Bac, 75007; 33-1-42-86-86-87. The Hôtel de Crillon (10, Place de la Concorde, 75008; 33-1-44-71-15-00; www.crillon.com), offering over-the-top luxury, stands right next to the site of Grimod’s family mansion, now occupied by the building that houses the United States Embassy. Doubles from 770 euros (about $1,180 at $1.53 to the euro). The Hôtel de la Bretonnerie (22, rue Sainte-Croix-de-la-Bretonnerie, 75004; 33-1-48-87-77-63; www.bretonnerie.com) in the Marais district operates in a restored 18th-century hôtel particulier, or private mansion, with exposed wooden beams and a magnificent wooden staircase that creaks at every step. Doubles from 135 euros. Almanach des Gourmands by Grimod de la Reynière. Paper copies are rare, but scans can now be found on Googlebooks. “The Invention of the Restaurant: Paris and Modern Gastronomic Culture” by Rebecca L. Spang (Harvard University Press, 2000). TONY PERROTTET is the author of "Napoleon’s Privates." His next book, about the underground Grand Tour in the Victorian era, will be published by Broadway Books. This is a great article that captures very well the atmosphere of Paris. If you feel nostalgic suddenly, I would recommend you to do your own Paris Tour in New York. Last week, I decided to stroll in "little Paris" - this is how I call Carnegie Hill. Not only you hear lots of French speakers walking on the pavement, but almost every shop is French or carry French stuff. Here are some of my discoveries. Jacadi has moved to 89th street and opened Obaibi, its sister store concept, at its former location on Madison and 92nd. Obaibi is the casual version of Jacadi with a more affordable price. Until now, I basically refused to shop for French clothes in NYC when I can buy them 3 time less in Paris. But this time, I can save a flight ticket and go to Obaibi. The prices are almost the same than in Paris. After stopping at Dean and Deluca to get a French baguette, Olive Oil from the Nice region,some saucisson and French imported Ham for dinner, I had lunch at Le Paris, the former Bistro du Nord @ 93rd and Madison. Same owner, same coziness and Gallic flavor but new menu, new decoration and new very nice waiters. I had one of the best Blanquette de Veau I ever had ! Anyway, I highly recommend Le Paris if you feel nostalgic of Paris. Opened 8 months ago on First avenue and 81st Street, Big Cheese offers a nice palette of excellent cheeses from artisanal and farmstead American to a vast array of Europeans cheeses. On the French side, I would recommand the smelly Berthaut's Epoisses washed in Chablis, the Roquefort, the Vacherin du Jura, the Morbier, the Brebiou or the Brie from Isigny. To accompany your platter, Big Cheese also offers different spreads, jams and crackers. My selection : Tapenade (olive spread), Creme de Marron (you can also make amazing cake with it), Black Cherry spread with Liquorice or White Fig spread with Bay Leaf on your Goat cheese. Look also at their interesting vinegars with champagne or black currant. For the aficionados of Raclette or Fondue, you will find the whole equipment and cheese. Just as I finished my post about Provence, I received an email from Stephanie Laurent annoucing her new restaurant Le Magnifique in the Upper East Side. Stephanie grew up on the French Riviera and she is offering here the traditional French cuisine of her childhood : sauteed fresh baby artichokes, branzino in a salt crust...and good thing Payard is closed, here you can get a lovely Parisian breakfast without the attitude : Fresh baked croissant, pain au chocolat, Oeuf a la coque,...while reading the local or international Press. Stephanie kept the same famous bossa nova brunch that she used to have at Buzina Pop (same location). And every Thursday from 8pm to 12am, Le Magnifique welcomes the Ladies Delight Evening, Belle de Nuit, with Dj Super Jamie and the 2nd drink offered. Send me your comments if you tested the restaurant. Last week, I discover this cute and intimate restaurant right in Chelsea, called Gascogne. This French restaurant specializing in southwestern French cuisine has a lovely dining terrace that reminds you of France. As they say, "secluded and shaded, away from the hustle and buslte". Nothing fancy but kind of romantic. Baked Mussels in garlic butter, glazed Sea Scallops Morell Mushrooms, Saute Snails in phillo dough, warm goat cheese with roasted walnut...and for dessert Profiterolles... Accompanying these dishes is an impressive array of local Gascon wines. And the extensive cartes des Armagnac is an undeniable find! After dinner, custom dictates that satisfied guests enjoy a glass of one of 1966's best bottles. And, a growing number are reviving the custom of savoring these precious Armagnacs at the bar with one of their favorite cigars. For Memorial Day or summer days - BBQ to go !!! If you are just craving for a great grilled and marinated food, Cuis'in offers a wide array of delicious pre-prepared dishes and sides ready to grill, with a large choice of salads and tarts. Order ahead and they prepare everything ready to be picked up or delivered for your week end. Cuis'in comes to your house with Chef Delalande and his staff and set up the perfect barbecue for you and your guests. From American Classic Burger & Hot-Dogs to High-end French delicacies, discover and enjoy the Chef's recipes for a great party at home ! French Wine-and-Cheese "Will Be Guests of Honor in Selected U.S. Homes"
"French Recipe for Launching 1,000 Parties"
"On June 4, a thousand American homes will hold wine-and-cheese parties courtesy of the French government. France has long played up its culture of culinary excellence. But now the government fears the country's highbrow food traditions may have alienated the average consumer. So, in an effort to boost sales of wine and cheese -- two of France's more lucrative exports -- it is trying to promote the laid-back apéritif, a moment before dinner when the French kick back with a glass of wine and some finger food. To get the message across, the French Ministry of Agriculture and Fisheries, along with various wine and cheese producers, is spending around €1.6 million ($2.1 million) to sponsor cocktail parties in 19 countries across the world, including the U.S., Canada and Spain. The French government will cover 60% of the overall cost of the program, and the wine and cheese companies involved are underwriting the rest. To promote its wine and cheese, France will subsidize a series of parties in U.S. homes. Guests sampling French products at a 2006 marketing event. "Some people are terrorized by French gastronomy, especially French wine," says Marie-Noëlle Guerin, head of external relations at Sopexa, a food-marketing company hired to organize the events. "We want to show that French cuisine can be relaxed too." Most of the parties will be large affairs hosted in city centers. In the U.S., however, the organizers are subsidizing a series of parties in private homes. Sopexa says it wants to capitalize on the increasing number of Americans entertaining at home as a money-saving tactic. Sopexa hired House Party Inc., a U.S marketing company that arranges sponsored parties, to pitch the idea to 100,000 people over the Internet. Would-be hosts are required to go to the House Party Web site and fill out a form. The company plans to choose 1,000 applicants who will receive coupons that offer 15% discounts on certain French wines and a free gift when they order French cheeses on specific Web sites. They also will receive a hamper of French-themed party gear, including a corkscrew, an apron and a CD featuring pop singer Carla Bruni, wife of French President Nicolas Sarkozy. In return for the gifts, the hosts must hold a party, take photos and blog before and after, in an effort to help create a buzz about French wine and food. After the party, they will have to answer a questionnaire seeking their opinion of the products they tasted. French wine and cheese producers are planning to follow up the parties with a series of special promotions of French goods at local shops and supermarkets. So far Sopexa says that more than 14,000 Americans have signed up to host a party. Phyllis Smith, a 38-year-old hospital worker in New York, is one of those hoping to be selected. "It's nice because it gives us a theme for our party," says Ms. Smith, who adds that she is hoping to invite 10 friends to the event. "Most of our parties are centered around wine anyhow." Like many other applicants, Ms. Smith is already a fan of French food. The organizers are hoping that by showing their friends a good time, their hosts can persuade them to start buying French wine and cheese too. To keep the parties affordable, the organizers chose some of France's less-expensive sparkling white wines, instead of Champagne. France's Iconic blue Roquefort cheese, which is taxed at 100% when imported into the U.S, was also crossed off the list as being too expensive. Taste, too, was an issue. Sopexa said pungent cheeses were a little too "scary" for American palates. The French decided to stick to milder varieties, such as goat's cheese and a nutty-flavored hard cheese called Comté." To be a part of the 1,000 Wine-and-Cheese parties across America sponsored by the French Ministry of Agriculture, Francophiles can now apply and register to be one of the 1,000 FCH party hosts by visiting the House Party website at www.houseparty.com/FrenchCocktailHour. Plus, (and this is the clincher!) one FCH host will win a trip for two to France and so will one party guest, courtesy of the French Government Tourist Office. And, to make it a totally interactive experience, each house party will have their own party page to post pictures, party tips, stories and videos before, during and after their parties that will also be streamlined on the national party page atwww.houseparty.com/FrenchCocktailHour for all eyes to see. January 6th, Day of Epiphany, but also in France, time to get your Galette des Rois. It's a golden pastry cake filled with an almond cream filling called frangipane, but what's original about it is that the baker put a small china called la fève. Back in the day, a dry fava bean was used instead of a figurine. The fève is baked into the cake, and the person who finds it in his slice becomes King or Queen for the day. 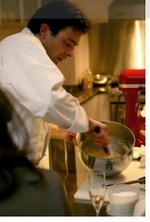 To learn more about Cuis'in and chef Eric Delalande, read "don't feel like cooking tonight" written November 05. Don't feel like cooking tonight ? Let's have Chef Eric Delalande cook for you. Your dinner will be delivered at home in the afternoon in ceramics dishes, ready to be warmed up and served. Every week, specials are different. I particularly recommend the soup and the quiche...Hachis is very good too ! For the Holidays, for the Foie Gras lovers, Homemade Foie Gras is available, elaborated with the greatest care, without any preservative nor additive. Making your own food for your babies and toddlers is often a brainer. Then jars often become the easy way !!! But no adults would eat those...for sure ! Since I discover the Beaba Babycook, my life is so much easier. It takes about 20mn to prepare, cook, mix and clean the mini-robot. Designed in France, the Babycook is multitask. Steamer, blender, reheater and defroster, it prepares fresh and healthy meals. Vitamins and flavor are preserve with the steaming process. Fast and easy to use, that's what I like about it. You can also get the recipe book to help you find new ideas. Blédina recommande cette recette à partir de 12 mois. Cuisson au cuit-vapeur pendant 35 minutes. Préparation du gigot comme pour les adultes. Ensuite, mixer la totalité avec une noix de beurre. From October 8th to October 13th, 75 % off at Broadway Panhandler on many of their cookware. Famous store for Home Cooks and Professional chefs as they carry most of the highest quality Kitchen Essentials. Every month, Demonstrations and Conversation combines on-site tasting and interviews of the best talented Chefs, so the admirers can meet them, learn to create some of their signature dishes, hear thoughts on a cornucopia of food and cooking topics and pick-up one or two of their secrets. You can find some of those recipes on their website. You are lazy or you are scared to cook for a lot of people, call Chef Delalande at Cuis'in and he will prepare your barbecue to go... Awesome !!! 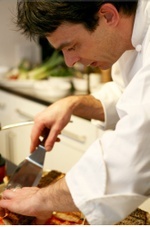 Choose your meat or seafood and Eric will create the appropriate marinades, dips and sauces. Ready to be picked up or delivered, all you need do is fire up your grill, put on the food, and you are all set. Cuis'in will also customize your barbecue or garden party. They will come to your house and cook for you the day of your party. Available in Manhattan, Hamptons, Westchester, New Jersey, Connecticut, Catskill... or wherever you are located ! 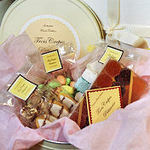 Dont know yet what to offer to your mother or your wife for Mother's Day ? Call quickly Cuis'In. Chef Eric Delalande will cook a Special Menu for your family and Cuis'In will deliver it to your house ready to be warmed up and served on Sunday between 8 and 11.30 am. Get the "Fete des Meres" Tin at Les Trois Crepes Patisserie. All gift wrapped with gros grain ribbon and French vanilla tissue paper. You can also find some kitchen and Bath gifts such as French soaps, provencal linens, candles, porcelaine...everything in the perfect French Tradition. A good review of the new French restaurants to open soon. ...Mr. Ducasse will open the New York edition of Benoit, a Parisian restaurant founded in 1912... Mr. Boulud’s new Bar Boulud, opposite Lincoln Center, is the most French of his restaurants, at least in its menu, a homage to his hometown of Lyon and the Burgundy region...Vittorio Assaf and Fabio Granato will open Brasserie Cognac at 1740 Broadway (55th Street), the first foray into France for these owners of the popular Italian chain Serafina...Later this year David Bouley plans to convert Danube, his ode to Vienna, into a French brasserie-style place. He expects the new brasserie, so far unnamed, to contrast with the ultrarefined new Bouley, to open in a few weeks on Duane Street opposite Danube (...)"
"The only opportunity I’ve had to write about cooking in my own voice is in my cookbooks, but those can’t capture my daily (or, in the case of this blog, weekly) thoughts. I think about food and cooking as a chef—that is, my ideas come day to day, depending on what I see at the market, what my fish supplier brings me, what new gadget seems intriguing. Though I only travel out of New York about one week each month, each trip brings fresh perspectives on techniques and introduces me to new spices, herbs, and other fascinating ingredients. And, of course, I love eating in New York. From the tacos and margaritas at Los Dados (where I often stop after a night of cooking at Spice Market) to the sublime sea urchin at Sushi Seki, New York cuisine never fails to inspire." 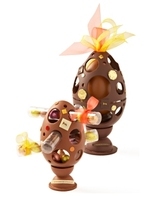 The Small Egg Treasure: Colorful and playful, this dark or milk chocolate egg contains barrettes of praline eggs to hide and move about in the spyglass holes of this egg like a trophy. And Limoges Easter Eggs, s'il-vous-plait ! An assortment of dark, milk and white chocolate covered pralines from the European chocolatier Café-Tasse, wrapped in golden foils. The box, a replica of a small egg carton, is just adorable. 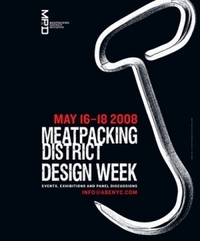 Beautiful graphic designs with classic and original fillings. A drawer of our Festive Garden egg-shaped combines with one tray of our tasting eggs collection.